Midsize pickups are ideal for buyers who prefer trucks but don't quite need the capability of a full-size pickup. Offering top-notch fuel economy and maneuverability that resembles that of a car, the 2018 Chevy Colorado in Evansville is one midsize truck you'll want to consider when searching for your next pickup. Slightly updated for 2018, the Colorado comes with a few new features that add to its appeal. You can read about these and more in our 2018 Chevy Colorado review below. 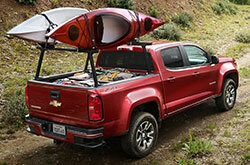 Those interested in the new Colorado can choose between two body styles: crew cab and extended cab. The pickup also comes in five different trim levels: Base, Work Truck, LT, Z71 and ZR2. The differences between the trims are mostly amenities - the Work Truck and Base models offer few options, but are very affordable. 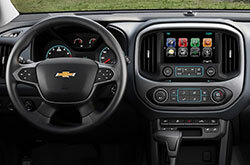 For the new model year, the 2018 Chevy Colorado in Evansville gets two new standard upgrades, which include a 7-inch touchscreen and Apple CarPlay and Android Auto integration. Outside of these features, buyers get rear jumps seats, satellite radio, heated front seats, navigation, an EZ-Lift tailgate and hill descent control on select models. 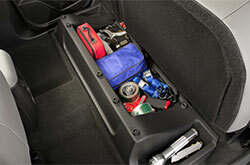 The Base Colorado comes fitted with a 2.5L inline four-cylinder, generating 200 horsepower and 191 lb.-ft. of torque. A six-speed manual transmission is mated to the engine. Other Colorado models can pair the base four-cylinder with a six-speed automatic or upgrade to one of two engines: a turbo 2.8L four-cylinder diesel or 3.8L V6. The former gets an eight-speed automatic and produces 308 horsepower and 275 lb.-ft. of torque, while the latter comes with a six-speed automatic and delivers 181 horsepower and 369 lb.-ft. of torque. The latest Colorado models are equipped with a hefty helping of safety features. Everything from traction control, anti-lock brakes and stability control to dual front side-mounted airbags, a Tire Pressure Monitoring System and child safety locks are included. Many 2018 Chevy Colorado reviews also praise the truck's dusk-sensing headlights, Post-Collision Safety System and Remote Anti-Theft Alarm System. 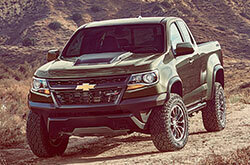 You can learn more about the Colorado by viewing it at our Chevy dealership in Evansville, Indiana. When searching for new cars in the Evansville metro area, you may have seen the 2018 Nissan Frontier, GMC Canyon, Honda Ridgeline and the Toyota Tacoma, but the 2018 Chevrolet Colorado is also a laudable option. 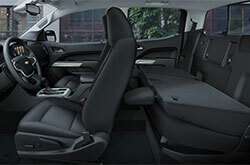 Its series of features and inviting persona may be just what you in an everyday vehicle. Use our review and try the compare tool to see if the 2018 Chevrolet Colorado is a best bet for your express needs; and if you decide it is, check out financing and leasing incentives available at Kenny Kent Chevrolet. 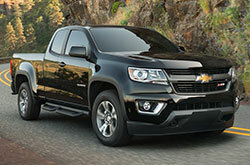 Interested in a Chevrolet Colorado and looking for attractive manufacturer incentives? Then visit us straightaway! Our review is here to aid you with making a discerning choice when searching for a car, and we hope it includes the knowledge you need for this. Get prepped to be blown away with the brand-new Chevrolet Colorado for sale in Evansville, IN. Call to schedule an appointment for a test drive. Would you like a chance to see it preceding your visit? Not a problem - looking at the included video clip will give you a glance at its exterior and interior from all sides.